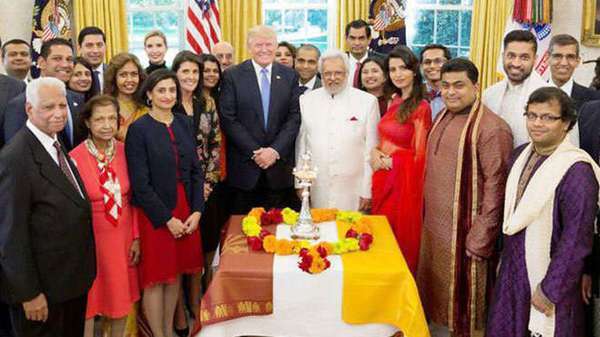 US President Donald Trump celebrated Diwali in Oval Office of the White House along with senior Indian-American members of the administration, including Nikki Haley, Seema Verma, and community leaders.Cabinet ranking Haley is US Ambassador to the UN and Seema Verma is the administrator of Centers for Medicare and Medicaid Services. Ajit Pai, Chairman of the US Federal Communications Commission and Raj Shah his Principle Deputy Press Secretary were among those from his administration. Daughter Ivanka Trump also joined the President in celebration of Diwali celebrations. Last year Ivanka, who is now a presidential advisor, had visited Hindu temples in Virginia and Florida as part of Diwali. Trump, then as the Republican presidential nominee, had addressed the Indian-American community from a public meeting in New Jersey wherein he lit the traditional diya. The tradition of Diwali celebration was first started by former President George Bush. During his term it was celebrated mostly in the India Treaty Room of the adjacent executive office building, which is part of the White House Complex. Bush never personally participated in the White House Diwali celebrations.